"My ongoing body of work, 'Still Points in a Turning World', explores our universal cross-cultural truths: the importance of family, community, ritual and the amazing diversity of its expression. My earliest memories are of spinning a globe, always drawn to the last mysterious corners of the world. Photographing the people, festivals and sacred sites in the tribal areas of Asia, my passion is to visually capture the rituals that define our lives and to create images that explore our human connections as they are formed. 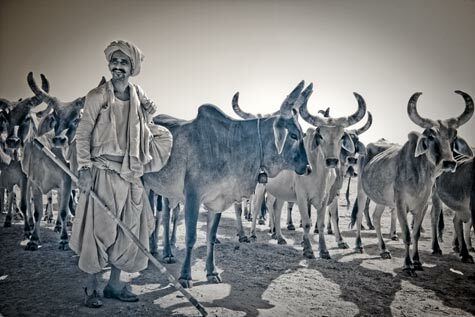 This series is from my travels in the Winter of 2010 to Southern Rajasthan & Gujarat exploring the tribal cultures of the Rabaris, Garasias, Bhils, Wadha and the reclusive Jats. Highlights of the trip were visiting villages where the traditions of different millennia co-exist side by side and the Baneshwar Mela where the tribal Bhil women performed early morning bathing rituals. My work is interpretive in nature. The photograph is the first step in the process. My technique often involves creating imagery using the invisible infrared light spectrum. I shot infrared film for many years. Now, I use a digital camera converted to infrared and the digital darkroom to create the split-toned imagery. It adds an element of mystery when creating the work, which, I feel, suits the subject matter and the timeless quality of the images.